Goodbye laundry, cooking, dishes and school run, my daily grind was behind me and was seeing the world through fresh eyes, the rooftops, the architecture, the crowds of pretty girls and handsome boys drinking wine in a haze of Gauloise smoke. Suddenly all the normal stuff seemed storybook, magical, inspiring and I was reminded of that great Woody Allen movie ‘Midnight In Paris’ and the literary lives that have walked the streets and felt that same inspiration. Now, Paris in the springtime 2015, is not an easy place to hold the fragile veil of nostalgia around you, packed to the gills with tourists waving smartphones and milling restlessly in two hours queues to tick the abundant attractions of the city off their bucket lists. But there are moments, rare and quiet, walking down a carless street, when you can let your imagination run free and pretend that you could bump into Hemingway and Hadley round the next corner, hand in hand, strolling in the April sunshine off for their morning café au lait. I imagined James Joyce drinking red wine with Picasso at the Stein Salon and wonder what life must have been like spending your days surrounded by and inspired by all these creative people who would go on to reach iconic status in the unimaginable future, drawing ideas from each other that would inspire writing that people are still reading and discussing now. I wanted to feel the nostalgia for myself, of a time before technology and celebrity as we know it now, but I could only borrow it. The modern world is a very different place but a place that is still influenced by the stories and paintings and lives of the past. 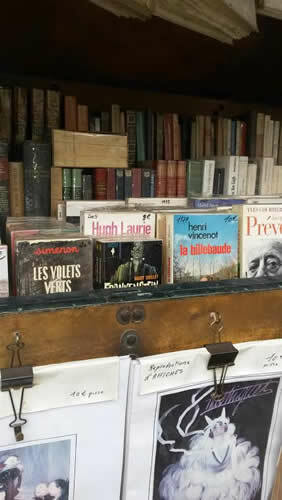 I planned to visit Shakespeare and Company in order to cling onto this oldy worldy vibe I had going on, so when I emerged from the dark and peaceful sanctuary of Notre Dame and spotted the bookshop over to the left, that’s where I headed. I was bouncing with anticipation to get off the tourist trail for twenty precious minutes of bookshop peace and quiet, just browsing and breathing. Deeply (mmmm, antique book smell). 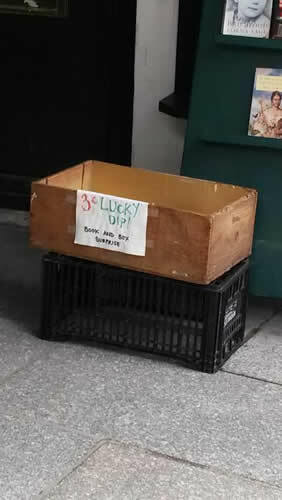 Call me naïve but…..well, anyway, twenty minutes later, after negotiating the two out/one in queue system, I was in. Well, nothing could take away from the beauty and the history of the building and the books but the word ‘jostled’ is the first that comes to mind. I was swept up in a kind of one way system that took me upstairs, squeezing into various nooks along the way to browse so I wouldn’t block up the flow. 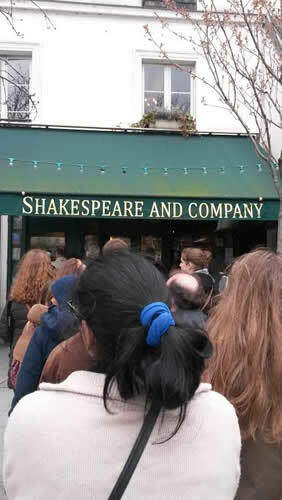 Don’t get me wrong, it’s an incredible bookshop but I was already a little stressed as my family were waiting in a café nearby, it was cold and I’d already spent ages trying to get in. But as I got to the top of the narrow staircase and traversed the creaky floorboards all I could think about was who else had stood where I was now standing. Ernest Hemingway and Ezra Pound had met here in the twenties, the actual roaring twenties! Had they sat in the window looking across at the cathedral and discussing their ideas? What books had they bought? Did they, too, pluck ancient texts from the shelves and inhale the holy scent of times gone by, did they? I allowed myself a few moments then headed back downstairs to purchase a little something, just to prove it wasn’t a dream and I had definitely been there! The panic set in, which book, which book!? 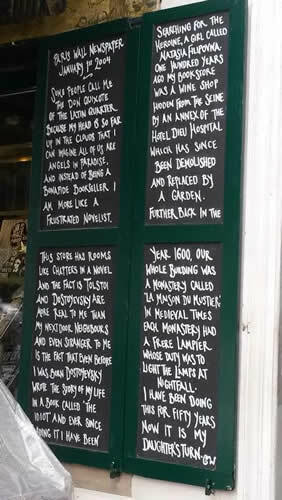 It had to be something that meant something, symbolic of my bookish pilgrimage to this holy grail of bookshops. 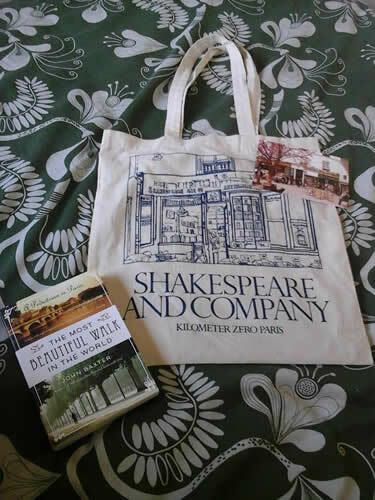 I freaked out for a bit then settled on ‘The Most Beautiful Walk In The World- A Pedestrian In Paris’ By John Baxter, that and a bag and a post card. 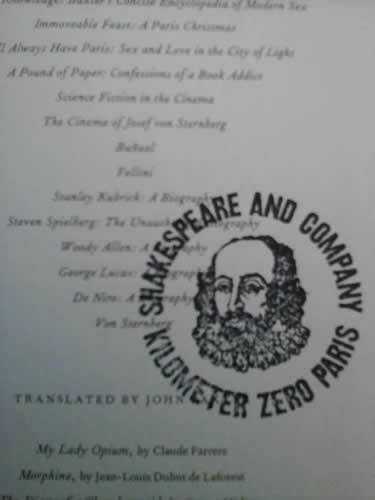 I don’t know if I’ll ever read it to be honest but I have a book about Paris bought and stamped by Shakespeare and Co Bookshop, Paris. Gotta be happy with that. 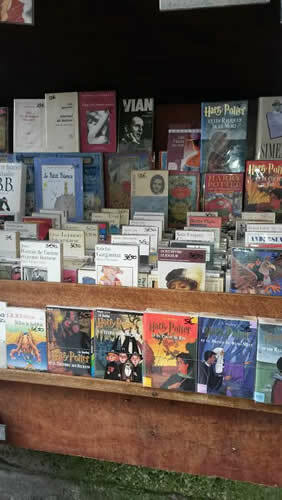 We were all obsessed with France by the time we returned home, the kids settled down to watch A Monster In Paris and I looked over at the book shelves and pondered the link between books and travel, books set in places I want to travel to and books I read when I travel. Even my husband, who only reads cookbooks, looks forward to a juicy novel when we go away. They are a heavenly combination designed for the escapologist in us. I mean even if there’s nowhere on this earth that gives you itchy feet you can always hitch a lift with Douglas Adams or fly away to Neverland. The possibilities are endless, you can even time travel, if the present isn’t doing it for you! 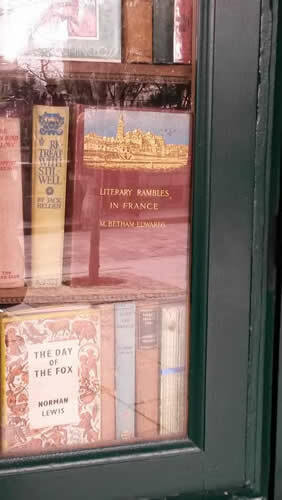 The books on my own shelf that caught my eye as far as France is concerned are by the wonderful Joanne Harris. 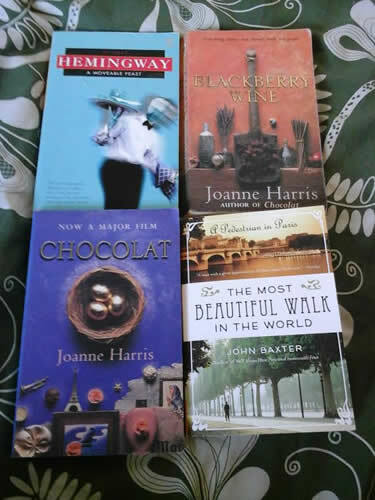 I last read Chocolat and Blackberry Wine years ago but I can still remember how they made me feel, sometimes you can feel the warmth of the sun from a story on your face. Also on my shelf and, as yet, unread is Ernest Hemingway’s A Moveable Feast. I do believe you can have books on your shelf for years before the perfect moment to read them presents itself and now is the moment for me to get better acquainted with Mr Hemingway! 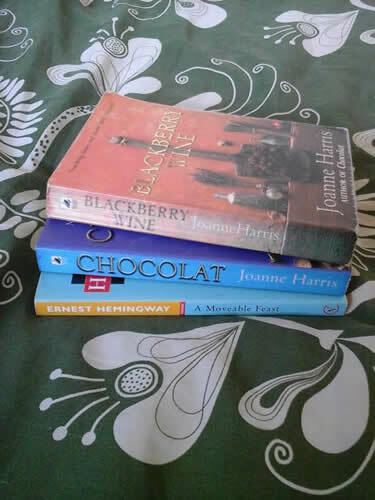 I stacked the books up and laughed at my autobiographical spine story, ‘Chocolate and Wine, A Moveable Feast’, yes indeed. If you want to take a virtual trip en famille I can also recommend Rupert Kingfisher’s Madame Pamplemousse books. So, if you’re in between books and need some inspiration don’t just head for the bestseller lists, pick a destination! Make a cuppa, get comfortable and go, go, go!